Coping with grief is the premise behind Jordan Harrison's fascinating drama Marjorie Prime, a tale which offers a bit of The Twilight Zone as it shows how remembrances of things past can become all important for future reminiscing, even if those recollections may not quite be the way it actually happened. 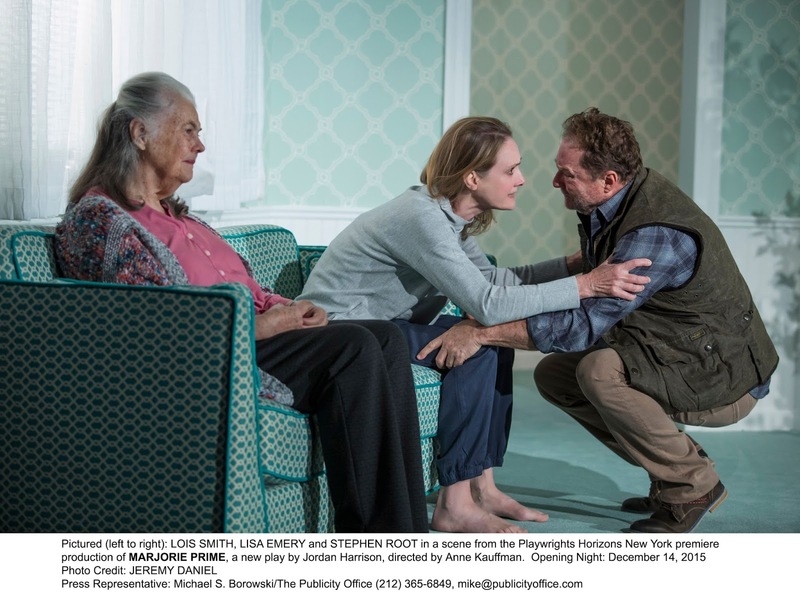 The show now running at Playwrights Horizons through January 24th. In the year 2062, Marjorie (Lois Smith), an 85 year-old widow, lives with her daughter Tess (Lisa Emery) and son-in-law Jon (Stephen Root). Mother and daughter have had a rather contentious relationship over the years, one that has become even more strained of late now that Tess and her husband are Marjorie's primary caregivers. Also living with the three is Walter (Noah Bean), a thirty-something, rather expressionless fellow who usually sits in a chair or stands in a corner until he is called upon. Walter, it should be explained, is what is called a "Prime". An artificial intelligence in the image of Marjorie's late husband the way she remembers him when they first got married. In the era in which this story is set, Primes act as a sort of grief coping mechanism. They helping people get through the tragedy of loss by offering comfort and companionship. Though while Primes may look like the deceased person in question, and are aware of the purpose for which they were created, they have no actual memories of who that person was or what they experienced. All of which must therefore be told to them. These facts becoming information that they can call upon later, word for word, in an effort to form an emotional bond with the person grieving from said loss. As Tess regards Walter, and Primes in general as little more than empty shells who basically just regurgitate what is said to them, it is Jon, a great believer in Primes, who takes it upon himself to explain to Walter his past with Marjorie. Instances such as how the two first met, other potential suitors in Marjorie's past, etc. Jon also recounting a long-ago death no one talks about, they all seeming to prefer to tiptoe around the subject or pretend it never happened. Even though this incident has obviously colored Walter, Tess and Marjorie's lives since then. However memories can be highly subjective, especially when taking into account the passage of time that's passed between the actual event and the telling of same. Some instances recounted by Jon to Walter as they relate to Marjorie may not be the way Tess remembers them happening. A conundrum which surfaces several times during the course of the play. What the playwright seems to be asking here is which is more important, the actual truth or the truth people chose and apparently prefer to remember? Or, when all is said and done, does the truth really matter at all? Another question the play keeps coming back to is the ultimate purpose of the Primes. Is it to ease the grief of the one who suffered a loss, or are they actually being used as crutches for those who really don't want to invest the emotional care towards those who need it and are instead more than happy to turn those duties over to someone else? This latter possibility seeming the more likely here. Especially when it comes to Jon, who seem far more interested in getting Walter up and running - and telling story after story - rather than instead interacting on a deeper level with Tess in order to help her through her own emotional upheaval over what's gone on since her father's death. Not to mention helping Tess work though the sometimes complicated relationships she has with her own children. Jon's lack of emotional support in these aspects becoming quite evident; especially later on in the story when another crises threatens to send Tess over the edge. Anne Kauffman does a good job with the direction, allowing the story to move at a rather slow and deliberate clip. The show's relatively short running time seeming almost triple that at points, through not in a bad way. The script as played giving the audience enough time to get to know these characters and understand their circumstances. This is especially true in the final scenes where the full parameters of the Primes, and their ultimate fate, come into play. All of which can be crystallized by the words "I'm afraid I don't have that information." Something the Primes utter when a question is posed to them that's outside of their frame of reference. Lois Smith is excellent, showing both the quiet rage and angry dignity of a woman who's reached a point in her life where she can no longer live on her own. Marjorie latching on to Walter Prime to help remind her of the person she once was and the life she once had. Emery is very good as Tess, a woman who, despite all the conflict she's had with her mother, ironically now finds herself bonding with her in a way she never has before. Perhaps because for the first time Tess is the adult in the relationship and it is Marjorie that needs her help. Though this is something neither woman would ever admit to the other. Root works well as Jon, perhaps the most interesting character in the piece. A man who desperately tries to find a middle ground between Tess and Marjorie and thus hopefully not really offend anyone. At the same time, he clearly loves his wife and will do anything in his power which he believes will ultimately help her. Even if this means using a Prime as an emotional anchor rather than being one himself. Jon and Tess' feelings about the Primes being a continual source of friction between the two. Bean is fine as Walter, a role that really doesn't give the actor that much room to work, the part calling for the character to basically remain in a holding pattern until someone calls for him. Yet at the same time, Bean also demonstrates a Prime's intense interest in learning. Learning about the person he was created to resemble, and that person's qualities, memories and history. It's this curiously that causes the Walter Prime to look into his namesake's past via letters and pictures he find in Tess and Jon's home. All for the purpose of helping the person for which he was created. Thanks to some clearly drawn characters, Marjorie Prime offers a sobering and insightful look at a future where grief can be dealt with in an entirely new way. Though one can't help but wonder what it says about a society where such a remedy may be rapidly becoming the norm. Featuring: Lois Smith (Marjorie), Noah Bean (Walter), Lisa Emery (Tess), Stephen Root (Jon).